End capitalism before it wrecks the Earth! Labour's energy price freeze: “sheer, unbridled socialism”? Last week’s successful firefighters’ pensions strike is unlikely to be the last action, unless the government returns to the negotiating table, according to the Fire Brigades Union. The four-hour strike on Wednesday 25 September in England and Wales was solid, with the vast majority of firefighters walking out collectively part way through their shift to set up picket lines outside stations. Firefighters held rallies across the country, including in Brighton, Cardiff, Leeds and London. Some London Underground drivers refused to take trains out in solidarity. Unite members in the Ineos oil refinery in Grangemouth have voted by 81% for strikes and by 91% for action short of strikes. The turnout was 86%. Unite called the ballot, and recommended a “yes” vote, to defend shop stewards’ convenor Stevie Deans, who has been subject to ongoing investigation by senior management since the summer of this year. The 20,000 members of Unite working in Higher Education have joined Unison and the University of College Union in balloting for strikes to win better pay. Unite says its members in HE, who work as technicians, laboratory assistants, facilities management workers, and admin staff, have faced a five-year “pay drought”, and have seen their real pay decline by around 13% since 2008. Since 2012, Workers’ Liberty members have been involved in supporting outsourced workers at the University of London in their fight for sick pay, holiday entitlement, and pension equality with their directly-employed colleagues. Their campaign, “3 Cosas” (“3 Things”), began after their hard-fought campaign to win the London Living Wage, which they won in summer 2012. Throughout both fights, the workers have been self-organised, holding regular workers’ and campaign meetings. On 1 October US Congress failed to agree a budget, causing many government offices to close. Showing a vigour in its cause which we’d like to see Labour display in ours, the Tea Party wing of the Republican Party refused to agreed the budget unless Obama’s healthcare law was gutted. Barry Finger explains the background. Over the weekend 28-29 September, eighteen leading members of Greece’s fascist Golden Dawn party, including party chair Nikos Michaloliakos, were arrested and charged with forming a criminal association. In a raid on Michaloliakos’ house, illegal firearms were confiscated, and 40,000 euros ($54,000) in cash. Thirty other Golden Dawn members were also arrested. Two high-ranking police officials have resigned last week because of their cooperation with the fascists, and others have been suspended from service until further notice or removed to other posts. George Osborne used his speech at Tory Party conference to announce a “new” work-for-dole scheme. In fact the proposals are nothing new — “work for the dole” (or workfare) schemes have been in place since 2011 across the country. This latest scheme (to be introduced in April 2014) will involve compulsory placements for the long-term unemployed like clearing up litter, daily visits to the job centre, or compulsory training. 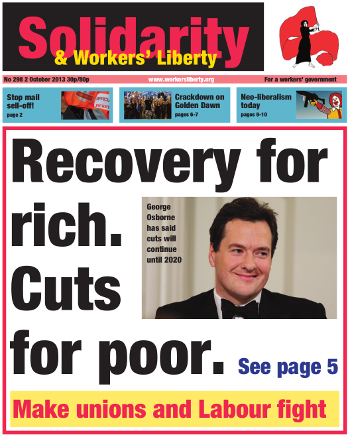 Tory chancellor George Osborne claims to have an economic recovery. If there is one, it’s not much of one, even in broad capitalist terms. On the latest figures, business investment, the central measure of the accumulation of capital, was down 2.7% on a year previously. In narrower terms, bosses and bankers have been doing well for a while. Take-home pay for the average boss of a top-hundred (FTSE 100) company was up to £4.3 million in 2012, an increase of 10 per cent on the previous year. In 2010-11, FTSE 100 bosses took an average pay rise of 12%.